Lithium-ion batteries are high performance energy storage devices used in many commercial electronic appliances. Certainly, they can store a large amount of energy in a relatively small volume. They have also previously been widely believed to exhibit no memory effect. That's how experts call a deviation in the working voltage of the battery, caused by incomplete charging or discharging, that can lead to only part of the stored energy being available and an inability to determine the charge level of the battery reliably. Scientists at the Paul Scherrer Institute PSI, together with colleagues from the Toyota Research Laboratories in Japan have now however discovered that a widely-used type of lithium-ion battery has a memory effect. This discovery is of particularly high relevance for advances towards using lithium-ion batteries in the electric vehicle market. The work was published today in the scientific journal Nature Materials. Many of our everyday devices that get their energy supply from a battery, whilst not always being as "smart" as they are described in the adverts, often come equipped with a kind of memory. For example, a battery powered shaver or electric toothbrush that is recharged before the battery runs out, can later take revenge on the prudent user. The battery appears to remember that you have only taken part of its storage capacity – and eventually no longer supplies its full energy. Experts refer to this as a "memory effect", which comes about because the working voltage of the battery drops over time because of incomplete charging-discharging cycles. This means that despite the battery still being discharged, the voltage it supplies is sometimes too low to drive the device in question. The memory effect therefore has two negative consequences: firstly, the usable capacity of the battery is reduced, and secondly the correlation between the voltage and the charge status is shifted, so the latter cannot be determined reliably on the basis of voltage. The memory effect has long been known to exist in Nickel-Cadmium- and Nickel-metal hydride batteries. Ever since lithium-ion batteries started to be successfully marketed in the 1990s, the existence of the memory effect in this type of battery had been ruled out. Incorrectly, as this new study indicates. 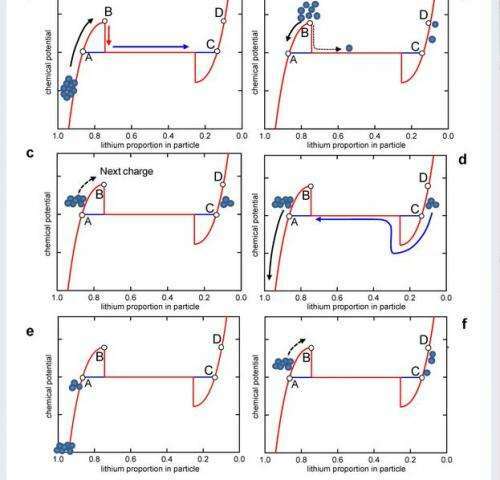 The memory effect and its associated abnormal working voltage deviation have now been confirmed for one of the most common materials used as the positive electrode in lithium-ion batteries, lithium-iron phosphate (LiFePO4). With lithium-iron phosphate, the voltage remains practically unchanged over a large range of the state of charge. This means that even a small anomaly in the operating voltage could be misinterpreted as a major change in the state of charge. Or, to put it another way: when the state of charge is determined from the voltage a large error can be caused by a small deviation in the voltage. The existence of a memory effect is particularly relevant in the context of the anticipated steps towards using lithium-ion batteries in the electric mobility sector. In hybrid cars in particular, the effect can arise during the many cycles of charging/discharging that occur during their normal operation. In such vehicles, the battery is partially recharged during each braking operation by the engine running in a generator mode. It is in turn discharged, and usually only partially, to assist the engine during acceleration phases. The numerous successive cycles of partial charging and discharging lead to individual small memory effects adding up to a large memory effect, as this new study demonstrates. This leads to an error in the estimate of the current state of charge of the battery, in cases where the state of charge is calculated by software on the basis of the current value of the voltage. The researchers identify the microscopic mechanism behind the processes of charging and discharging as the ultimate cause of the memory effect now found in lithium-ion batteries. The electrode material – in this case lithium-iron phosphate (LiFePO4) – consists of a large number of small, micrometer-sized particles which are charged and discharged individually one after the other. Researchers refer to this model of charging and discharging as the "many particles model". Charging proceeds particle by particle, and involves the release of lithium ions. A fully charged particle is therefore lithium-free and comprises only iron phosphate (FePO4). Discharge in turn involves the re-incorporation of lithium atoms into the electrode particles, so that iron phosphate (FePO4) becomes lithium-iron phosphate (LiFePO4) once more. The changes in the amount of lithium associated with charging and discharging induce a change in the chemical potential of the individual particles, which in turn changes the voltage of the battery. However, charging and discharging are not linear processes. During charging, chemical potential initially increases, with the progressive release of lithium ions. But then, the particles reach a critical lithium-content value (and chemical potential). At this point, there is an abrupt transition: the particles give up their remaining lithium ions very rapidly, but are not allowed to change their chemical potential. This is the transition that explains why battery voltage remains practically unchanged over a wide region (voltage plateau). The existence of this potential barrier is vital for the memory effect to become manifest. Once the first particles have overcome the potential barrier, and have become lithium-free, the electrode particle population gets split up into two groups. In other words: there is now a clear distinction between lithium-rich and lithium-poor particles (see graphic). If the battery is not fully charged, a certain number of lithium-rich particles that have not made it over the barrier will remain. These particles do not remain on the edge of the barrier for long, because this state is unstable, and they will "slide down the slope", that is, their chemical potential will decrease. Even when the battery is discharged again and all of the particles will come to rest in front of the barrier, this division into two groups will be maintained. And here is the crucial point: during the next charging process, the first group (lithium-poor particles) will overcome the barrier first, whilst the second group (lithium-rich) will "lag behind". In order for the "delayed" group to get over the barrier, their chemical potential must be increased, and this is what causes the overvoltage (the "bump" in the graphic) that characterises the memory effect. The memory effect is thus a consequence of the particle population being divided into two groups, with very different concentrations of lithium, which is followed by the particles "jumping" over the potential barrier one after the other. This overvoltage, through which the effect is noticeable, is equal to the additional work that needs to be done to carry the particles that lagged behind after a partial charge, over the potential barrier. The time that elapses between charging and discharging a battery plays an important role in determining the state of the battery at the end of these processes. Charging and discharging are processes that alter the thermodynamic equilibrium of the battery, and this equilibrium can be achieved after some time. Scientists have found that idling a sufficiently long period of time can be used to erase the memory effect. However, in accordance with the many particles model, this only happens under certain conditions. 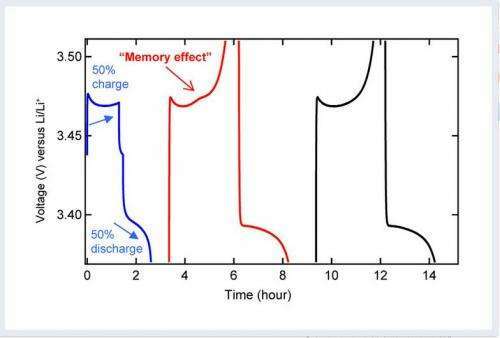 The memory effect only vanished if one waited a sufficiently long time after a cycle of partial charging followed by full discharge. In such cases, the two particle groups were still separated after the full discharge, but were found on the same side of the potential barrier. Thus, the separation disappeared, because particles attained an equilibrium state, in which they all had the same lithium-content. The memory effect remained however providing you waited after the partial charging and before the incomplete discharge. Here, the particles were on opposite sides of the potential barrier, and this prevented a reverse of their division into "lithium-rich" and "lithium-poor". 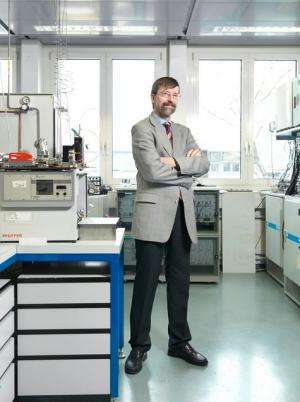 According to Petr Novak, Head of the Electrochemical Energy Storage Section at the PSI and co-author of the publication, the study disproves a long cherished misconception: "Ours is the first study that has specifically looked for a memory effect in lithium-ion batteries. It had simply been assumed that no such effect would arise". To acquire knowledge via research is often a fruitful mix of speculation and diligence: "Our finding results from a combination of critical investigation and careful observation. The effect is in fact tiny: the relative deviation in voltage is just a few parts per thousand. But the key was the idea of looking for it at all. Normal battery tests usually run deep, and not partial charging/discharging cycles. It thus took a flash of inspiration in order to ask what might happen during partial charging in the first place. For the future use of lithium-ion batteries in vehicles however, this recent discovery is not the final word. It is indeed absolutely possible that the effect could be detected and taken into account through clever adaptation of the software in battery management systems, Novak pointed out. Should that prove successful, the memory effect would not stand in the way of a reliable and safe use of lithium-ion batteries in electric vehicles. So now, engineers face the challenge of finding the correct way of handling the peculiar memory of batteries. Salt power: Watt's next in rechargeable batteries? Thought this was common knowledge. You have just discovered polarization. Deep discharge is not the problem you are mentioning. Its name is over discharge. This is why you need to introduce monitoring electronics.